One of Rajasthan's most important local festivals is the spring festival of Gangaur celebrated in March-April. Dedicated to Gauri, a manifestation of goddess Parvati and the consort of Lord Shiva, it symbolizes conjugal bliss and marital happiness. 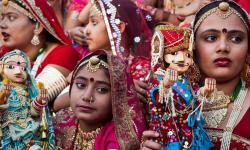 A festival of maidens and married women, it begins on the day following Holi, and is celebrated for 18 days. While married women pray for the well being of their husbands, young girls pray for a groom of their choice. Wooden image of Gauri are colorfully dressed and bedecked with jewels. Offerings are made in every home accompanied by the singing and dancing of women. 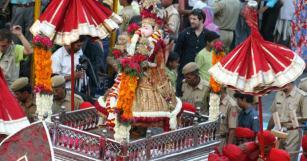 The festival is celebrated with great pomp in Bikaner, Jodhpur, Nathdwara and Jaisalmer. Around Bundi, Kota and Jhalawar the fields are covered with blossoming poppy flowers at this time. Maidens collect these flowers and make wreaths for the goddess. In Jaipur on the 17th day following Holi a grand procession is taken out of the City Palace and the goddess Gauri is carried in an elaborate palanquin led by colorfully attired elephants, camels and horses. Dancers, musicians, drum beaters, bandsmen, and battle dressed chariots accompany the procession.